The WOCU’s advantage is that it is a natural currency stabilizer. The WOCU acts as an apolitical “Well-oiled shock absorber”, naturally smoothing out exchange rate volatility. The WOCU is applicable across a huge financial spectrum; trading of goods and services both on and offline, corporate treasury, asset and fund management, savings and bonds: from whole nations down to individuals. 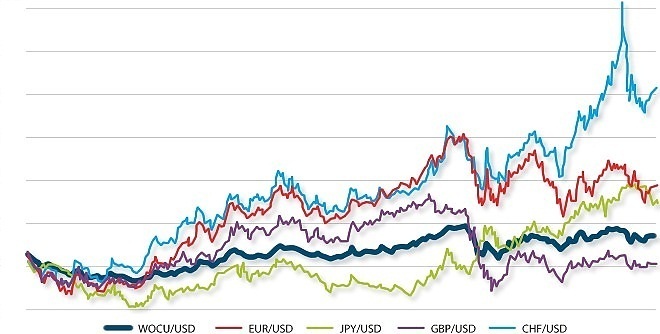 Use our interactive Volatility Tool to see how the WOCU can smooth out currency fluctuations. Whilst the WOCU is a derivative currency basket comprised of quoted currencies with a regularly updated weighting based on public data: the WOCU is not a made-to-order bank-formulated product – the WOCU is available off the shelf, logically valued and free from the potential for manipulation. The WOCU cannot be "gamed" to a user’s disadvantage. Concerned about the Euro? The WOCU is the market solution to the political problem. It can be compared to a global ECU and will simply and elegantly adjust to any Euro drop outs or collapse. Currency wars? QE? Sterling on the slide? Imagine the attractiveness of deposit accounts denominated in a transparent, universal and stable currency reference to protect savers from Sterling weakness and negative interest rates! WOCU denominated savings are the answer. The WOCU offers financial institutions the ability to derive new revenues from a new currency unit for the first time this Century. It offers wider benefits than the Euro, and avoids the problems associated with it. This opportunity is the first of its kind since the ECU was first traded 20 years ago. Financial institutions will act as liquidity providers in WOCU FX forwards, swaps and fixed income business and facilitate settlement, clearing and day-to-day personal and corporate transactions. Why restrict yourself to dealing in USD, just because that’s the way it normally is? Agree (and settle) your trade in WOCU and free yourself from $ and trading partner currency volatility = more certainty, at minimal cost. The WOCU can be seen and used as a stable "hub" for international trades, each trading partner only having to deal with the reduced volatility of its "spoke" to the trade, and not the whole range of volatility. The casino effect of currency volatility is tamed by the WOCU, trade being profitable for the sake of the trade itself. International transaction returns become independent of wrestling with volatility and hedging. A Corporate Treasurer using the WOCU need not worry that his company’s gross margin in its domestic currency is less than the volatility of the currency he has to deal in. Apolitical, fungible and stable, the WOCU is the perfect off the shelf management tool. The WOCU gives trading parties a head start and increases trading confidence by removing uncertainty by providing a less volatile trading environment. 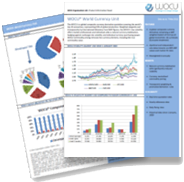 By denominating in WOCU international company accounts can be compared and analysed on a level playing field, automatically stripping out a large part of currency volatility effects. Online virtual currencies are proprietary, near-impossible to convert into real currencies and can be both impenetrable and highly volatile. The WOCU provides a solution to these issues. By linking to the WOCU as an anchor, trust, faith and real liquidity can be embodied into an online currency, insulating its users from excessive volatility of a single currency, be it virtual or real. The WOCU serves as a reliable and stable global unit of account and store of value. The WOCU is designed for trade, not speculation: WOCU linked online currencies have a measurable worth, bringing reality into the virtual online currency world. Why artificially link to a single national currency, critically exposing your currency and economy to potential turmoil and political manipulation elsewhere? There is no such thing as a single safe haven currency in today’s ever changing world. Instead, link your national currency to the WOCU as a relatively stable, predicable and open benchmark – the WOCU is your obvious currency anchor alternative.